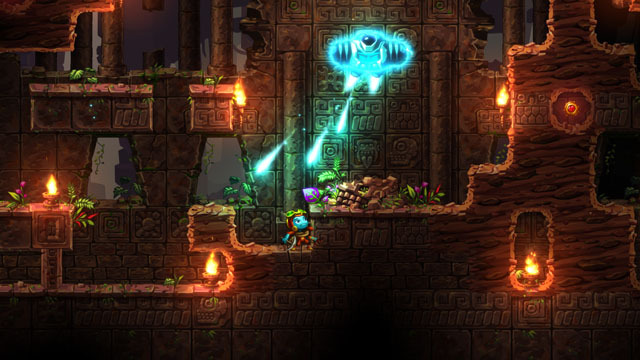 Steamworld Dig 2, from Image & Form is the follow-up to Steamworld Dig, a surprising entry in the otherwise overcrowded mining genre, focusing less on crafting and inventory management, and more on metroidvania-style adventuring. The sequel features a new steambot named Dorothy who teams up with a cloaked companion to seek out her lost friend in the deep dark depths. The new release offers similar gameplay to the original with the player pickaxing through dirt and rocks in search of treasure while avoiding pitfalls and traps. Along the way, Dorothy fights enemies and earns new abilities that allow her to move more quickly and access new areas. The new game has been given a substantial visual overhaul as well, featuring more detailed environments and better lighting effects. The game is coming to Switch via the eShop and other unannounced platforms in 2017.